The Art of Fusion: Hublot’s transboundary collaboration with Bruce Lee Foundation staging “Legend Never Dies: Bruce Lee 75th Anniversary Exhibition” in Hong Kong, where the Spirit of Big Bang Bruce Lee Limited Edition makes its debut to pay tribute to the legendary superstar. 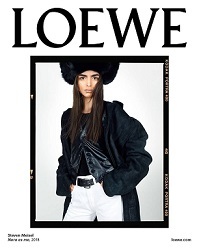 With his kingly manner and profound knowledge of east-west cultural fusion, Bruce Lee was crowned the oriental legend with his one and only Jeet Kune Do martial arts skill. 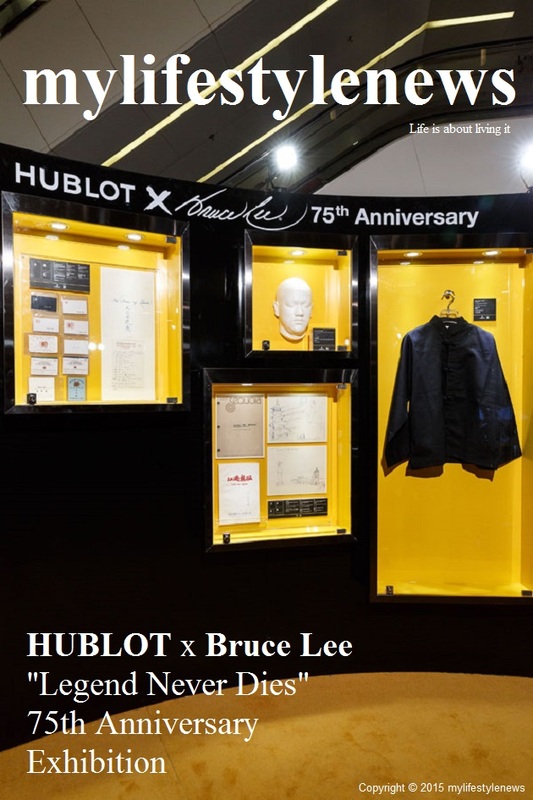 As this year marks the 75th anniversary of his birth, HUBLOT joins hands with Bruce Lee Foundation, established by the wife and daughter of Bruce Lee – Linda Lee and Shannon Lee, to hold the “Legend Never Dies: Bruce Lee 75th Anniversary Exhibition” for seven days to commemorate the kung fu maestro and his glorifying achievements in all aspects, as well as reviewing his exclusive philosophy in martial arts. 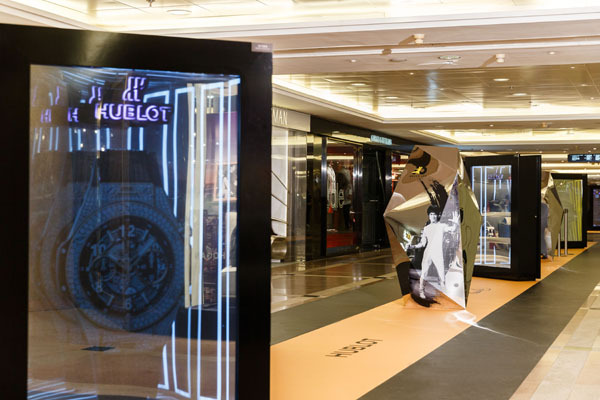 The exhibition was held in Gateway Arcade, Harbour City in Tsim Sha Tsui, specially featuring the debut of the Spirit of Big Bang Bruce Lee Limited Edition. 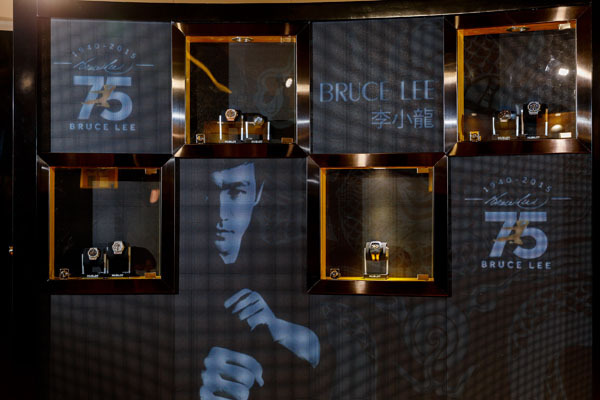 The exhibition was divided into two parts – “Retrospective of movies and treasures of Bruce Lee” and “Legend Never Dies”. The former one features four sets of Bruce Lee’s treasures provided by Bruce Lee Foundation: 1. the genuine Gung Fu jacket which carries the martial art spirit of Bruce Lee; 2. the Life Mask – the mold used to produce Bruce Lee’s Kato Mask in the movie “The Green Hornet”, which commemorates the classic character that opens Bruce Lee’s Hollywood movie market; 3. 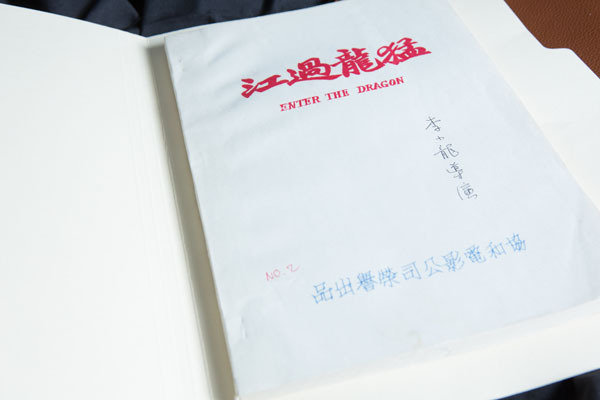 Bruce Lee personal genuine copy of the “Way of the Dragon” script, this film was originally titled “Enter the Dragon”, the script reflects the original titles; 4. “The Game of Death” script cover, scene breakdown and sketches, handwritten and drawn by Bruce Lee, illustrating his vision of the pagoda; 5. Bruce Lee’s business cards and Jun Fan Gung Fu Institute membership cards which has witnessed the incredible experiences of his apprenticeship in the States. 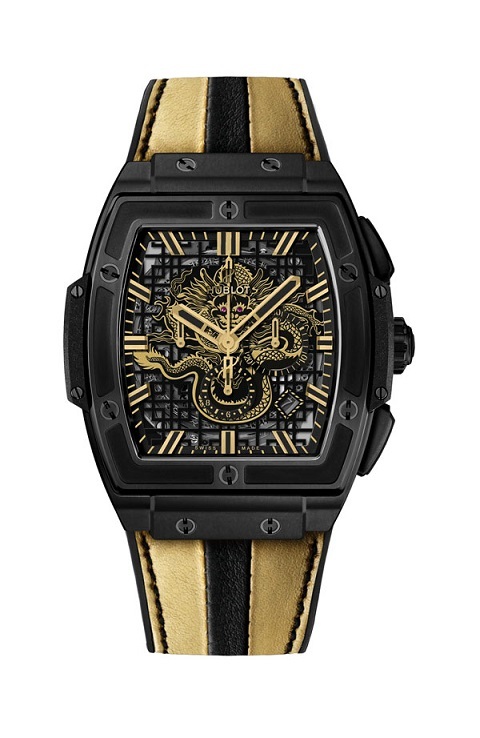 Hublot Spirit of Big Bang Bruce Lee Limited Edition will make its debut in the exhibition, paying tribute to the legendary star. 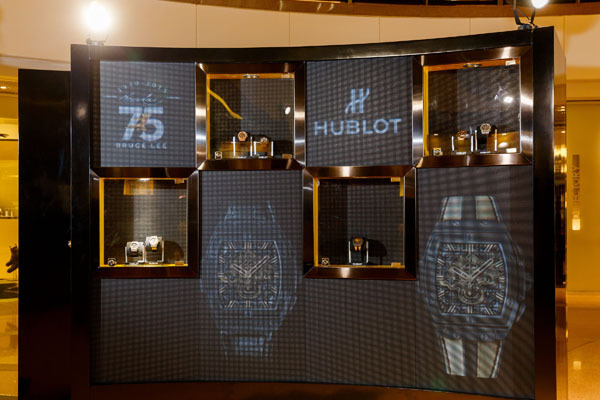 In addition to the precious treasures and exhibits, Hublot also adopts modern technology to create the Breaking Mirror animation. The cylinder glass case showing Bruce Lee animation on a transparent screen in the middle with breaking parts of the Hublot watch and mirror pieces. 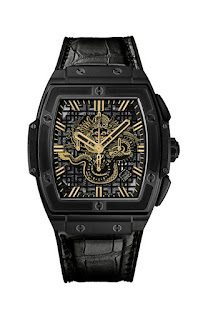 On the bottom is a 3D effect of Hublot UNICO movement – the fusion of Hublot and Bruce Lee. Another feature of the exhibition is the mirror room inspired by the final battle of Bruce Lee’s movie “Enter the Dragon”, which achieved great success and triggered a craze for kung fu in the world. One side in the mirror room shows Bruce Lee’s appearance while the other side is decorated with special designed mirror, allowing the guests to enjoy the light and shadow interaction with Bruce Lee through different angles of reflections of the mirror. The second zone of the exhibition is located at the corridor of the Gateway Arcade, “Legend Never Dies” - the four “Diamond Rock” displaying the most representative photos of Bruce Lee in the 60’s selected by the Bruce Lee Foundation. 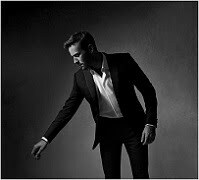 Hublot adopts the ultramodern design to present the watch images in six Eternal Showcase with Bruce Lee images to symbolise the heritage of Bruce Lee spirit and philosophy on martial arts. As the most influential and legendary superstar worldwide, Bruce Lee was the perfect definition of Hublot’s motto, “to be first, be unique and be different”. Being the pioneer of an era, he was the first one to spread the culture of Chinese kung fu to the world and endeavored to propagate east-west culture in his sparkling life. He broke the traditional boundaries of different martial art styles, and integrated Taoism philosophy of the East with boxing, karate and taekwondo in the creation of Jeet Kune Do, which was the unprecedented epitome of the art of fusion. 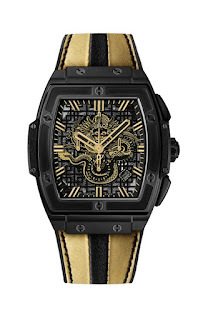 Possessing the Spirit of Big Bang and the unique DNA of Hublot, the Spirit of Big Bang Bruce Lee Limited Edition featuring a tonneau case with yellow elemnts is a tribute to Bruce Lee. 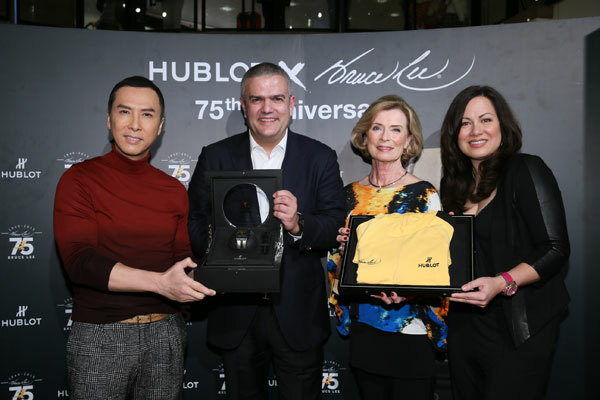 Jointly designed with Bruce Lee Foundation, Hublot Spirit of Big Bang Bruce Lee Limited Edition is inspired by the dragon on Bruce Lee’s desk. 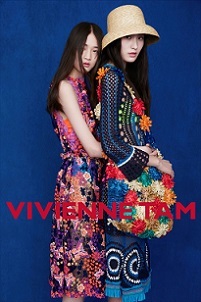 The timepiece is a limited edition of 75 pieces worldwide priced at HK$232,400. 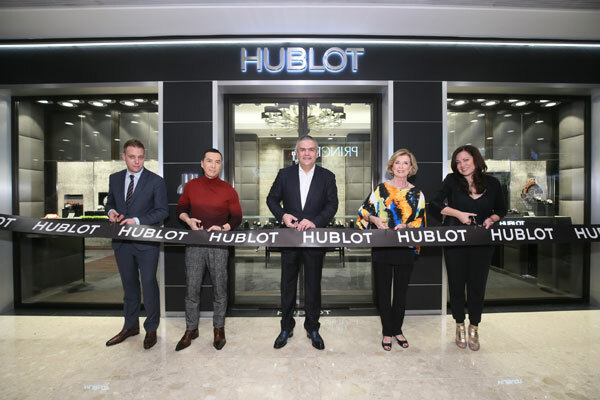 It is equipped with Hublot’s new movement HUB4700, frequency: 5 hertz, 36,000 beats/hour; 278 parts, 31 gems, automatic winding with 50 hours power reserve and the utmost exquisite skeleton dial is clearly visible through the sapphire with anti-reflective treatment and Hublot logo printed on the inner side. The date display window is at 4:30 position and the dial design makes use of central chronograph hand. The three little dials are positioned at 9 o’clock (second), 3 o’clock (30 minutes) and 6 o’clock (hour). 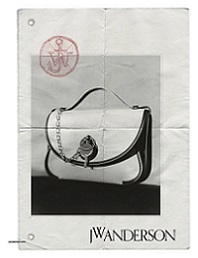 The strap is made of alligator leather with natural rubber, offering supreme comfort and style.